How green are our greengrocers? 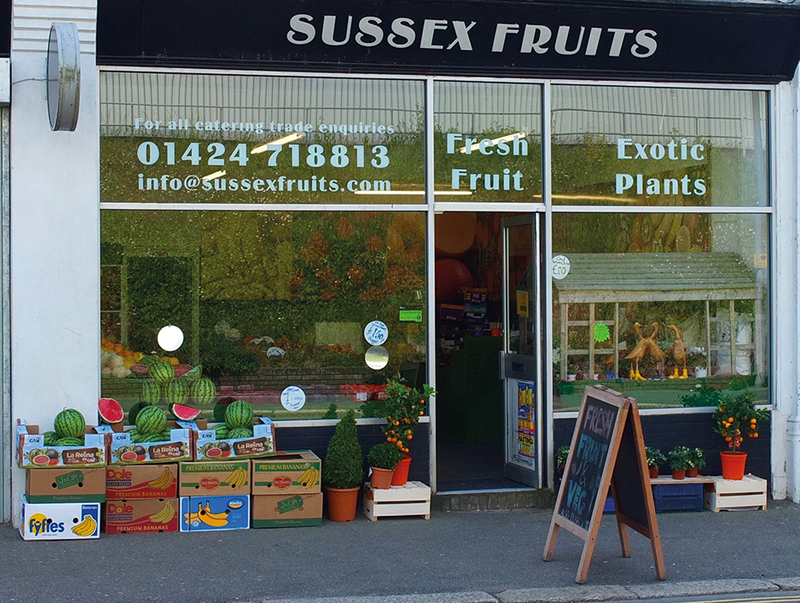 Stewart Desborough and his brother, Tim, opened Sussex Fruits on Bexhill Road in West St Leonards, opposite Carpetright, in December 2017. “We haven’t done any advertising, but being on Facebook has been fantastic, that has got me started,” says Stewart who is “happy and honoured at local (customer) response, they’ve been fantastic. Finding local suppliers is hard work, reveals Stewart who is currently looking for a source of hessian bags to replace plastic carriers. Sussex Fruits gives shallow cardboard boxes to customers with a car and will take these back on the next visit. Stewart will happily split punnets to smaller quantities for pensioners and others wanting small amounts and customers may taste fruit before buying. In unlovely London Road the St Leonards Grocery is also a family business. 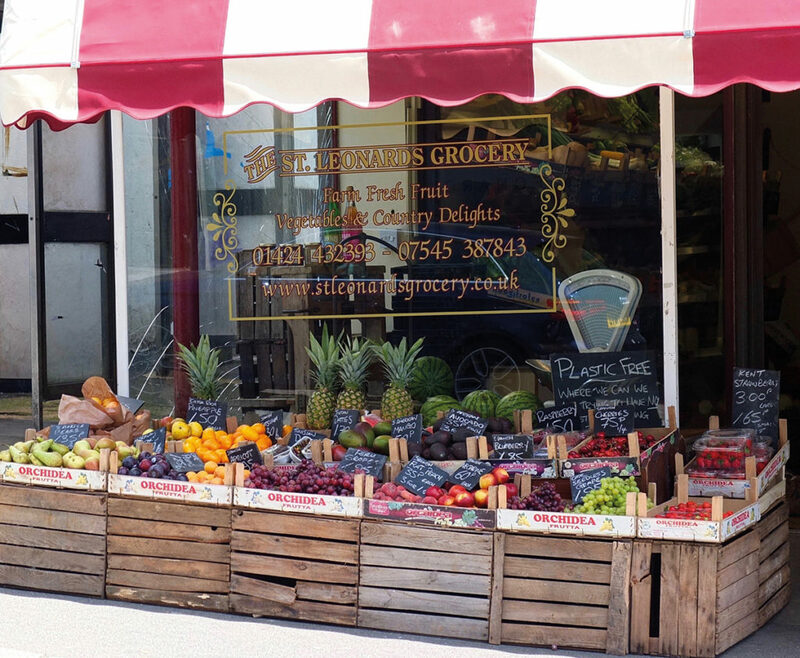 “My dad has owned it since 1992 – there used to be four greengrocers in the immediate area, now we’re the only one,” explains Craig McClelland who now runs the business..
“Everything stocked that is seasonal is locally sourced, mainly from farms and small producers in Kent and Sussex. “We’re trying to completely get rid of plastic packaging, but some things (eg lettuce) dry out very quickly without the cellophane wrap.” They’re fine without if sold and eaten the same day, but at present this is a necessary compromise. Definitely upmarket, the St Leonards Grocery reflects its local customer base, not the cheapest but offering a wide range of high-quality produce from makers and suppliers in the vicinity: South Downs honey (Lancing), eggs, chicken duck and goose, cheese (Alsop and Walker – Mayfield), yoghurt and milk in glass bottles from High Weald Dairy (Haywards Heath), Ringden Farm fruit juice (Ticehurst), jams and chutneys (Martha and Ed’s Kitchen – Battle). The vegetable selection is constantly evolving, large heritage tomatoes are currently very poplar while, as Craig admits, who knew about turmeric root just a while back? 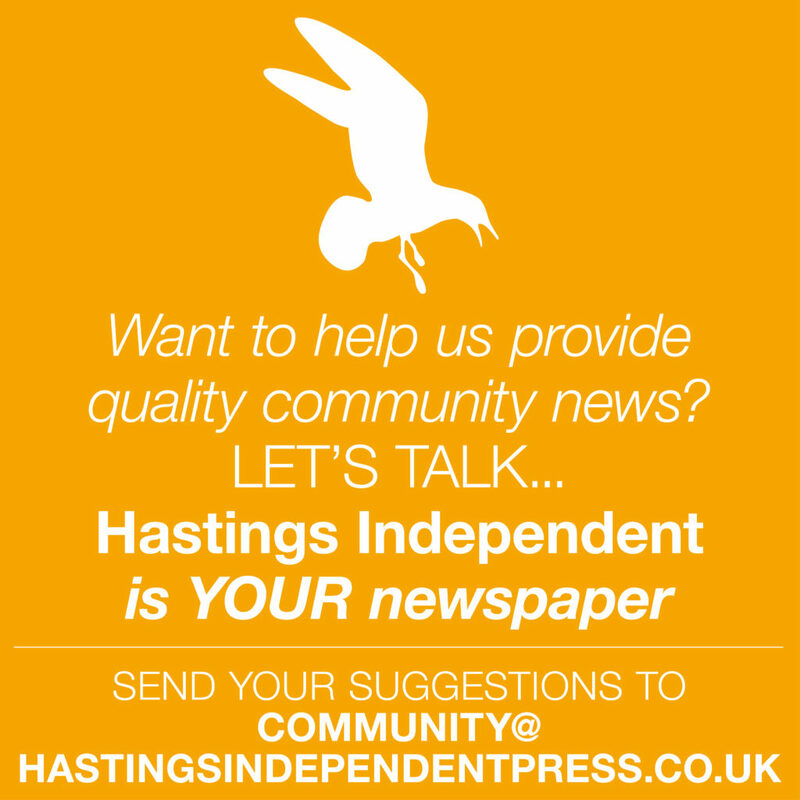 St Leonards Grocery relies mostly on word of mouth and personal recommendation for its steady footfall, but has lately turned to social media to spread the word. “I’ve come in from Robertsbridge by bus to shop here,” says a woman at Hastings Fresh Fruit & Vegetables on Queens Road. 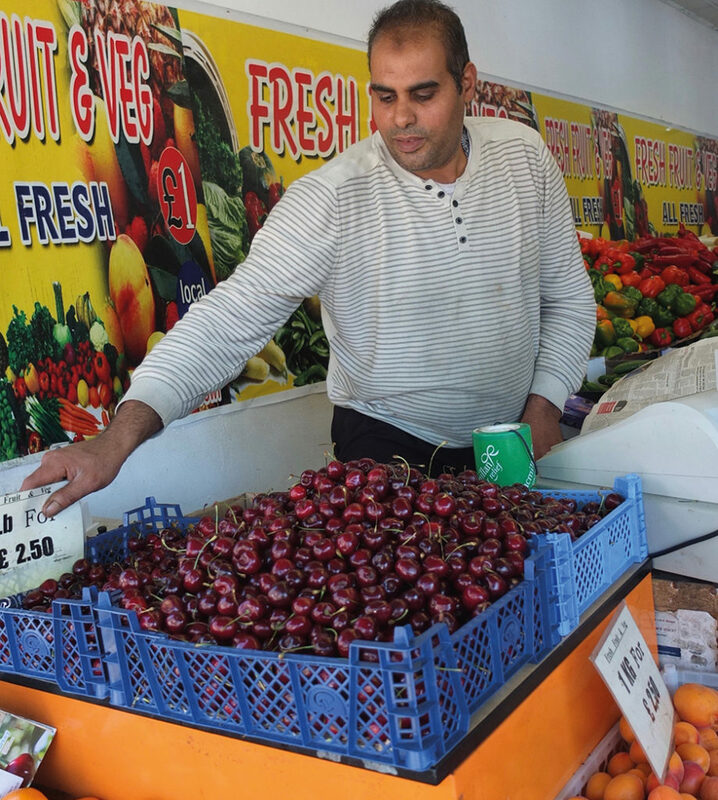 ”We’ve been here three years and are open 6.30am -7.30pm seven days a week,” says Essat who manages the shop for owner, Rabi Awar. “Go on try,” he urges pointing at some dates, pleased for customers to taste before they buy. New produce comes from London markets five days a week, and with Morrisons just up the road pricing is very competitive. “The plastic bags are free,” explains Essat, “but many people bring their own carriers”. Clearly packaging is not his shoppers’ most pressing concern. “Price is very important to them,” says Essat, “we aim to be cheaper than the supermarkets. People can buy loose, in bunches or even a single carrot,” he adds, demonstrating how small shops score over supermarkets offering indivisible packaging (we’re looking at you, Asda) and help people on a tight budget both save money and avoid wasting food. The range here is very wide, anyone planning to cook African or Caribbean dishes will find yam, cassava and plantain. 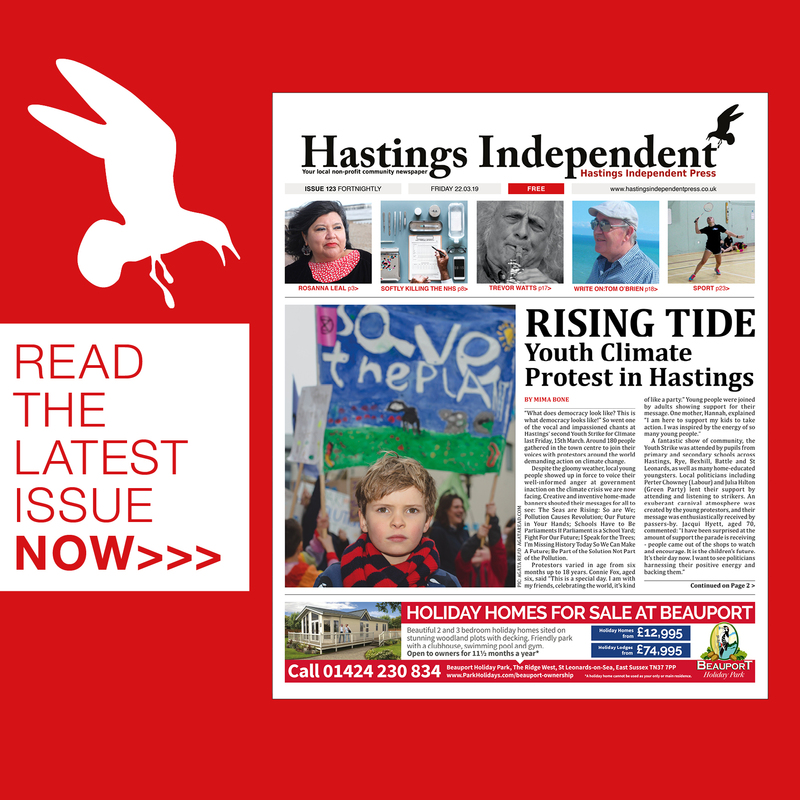 For most other vegetables there’s a choice between English and foreign alternatives, (for example, smaller Turkish cucumbers) the food choices reflecting Hastings’ diverse communities. “If they’re not happy they don’t come,” says Essat simply; it seems many customers are prepared to travel a good distance, clearly a vote of confidence.